This is the start of many delicious football-ish/game day foods. It’s August twenty-seventh, which means we have only about two weeks left till the start of football. I know that some people get excited for the start of football season for, well – the football. For me, football season symbolizes cozy fall nights by the fire and some really good food. Therefore, I figured that it was probably time to slowly start dishing out the football inspired foods. Plus, how perfect would these burgers also be for the long Labor Day weekend coming up??? Which by the way, I cannot believe it is already Labor day weekend. How does this sneak up on me every year?? Do you guys have any fun plans? 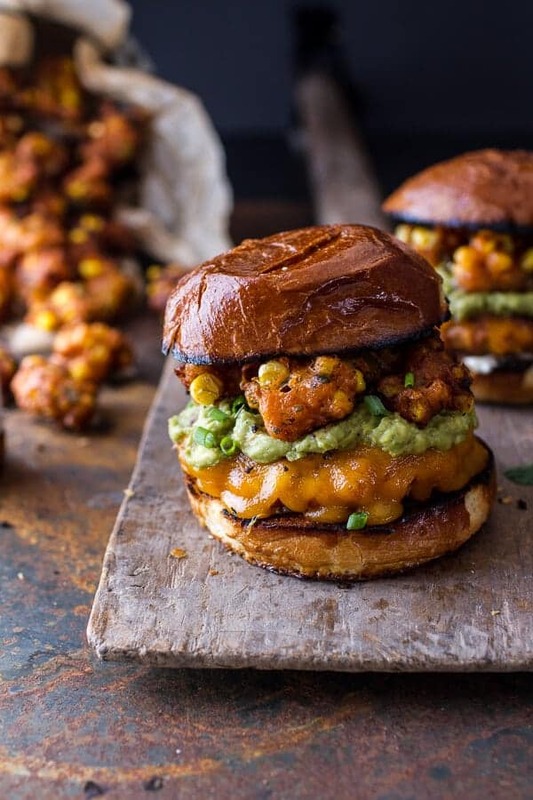 Since I really have nothing too exciting to share, let’s just get right to these Chipotle Cheddar Burgers with Corn Fritters today. The truth is these burgers are all the excitement this post needs. I mean, did you read the street corn fritter part?? I am going through a corn frenzy at the moment…err, corn and tomato frenzy. Can you blame me though? It’s the height of the season and I cannot get enough. Basically what I am trying to say is, I would expect a lot of corn from now through September. It’s gonna be gettin good. The base of these burgers start out with a super flavorful and moist ground chicken. Well, I used chicken, but you could use turkey too. I seasoned the meat with some spices and chipotle chile peppers. I know that chicken and turkey burgers can tend to be a little dry, but not these. All you taste is deliciousness and a whole lot of cheddar cheese. FYI, the combo of chipotle and cheddar will always be a favorite of mine. The seasoning I used for these burgers is a combo I have been using since way before the blog. I first started using it when I began making my brother steak burritos after snowboarding. I just experimented a little and found that this combo worked pretty awesomely. It’s one of my favorite seasonings. A little spicy and just a teensy bit sweet. Perfection. Ok, so I love the burgers, but to be honest they are just a vessel to hold the street corn fritters. Oh my gosh, these fritters. It’s no secret that I love corn fritters. I mean, I have made kind a few over a short period of time. These sweet ones paired with summer fruit, these savory BLT fritters and these delicious fritters that I need to make again, stuffed with spinach, artichokes and BRIE! These street corn fritters though?? Well they may be my new favorite out of them all. 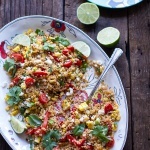 Do you guys remember this Mexican street corn quinoa salad? Well, I took those flavors, took away the quinoa, added lots of cotija cheese and fried them into the cutest little fritters to place on top of your burgers. They’re the best thing ever. I love fries on my burgers, but fritters may just be better. 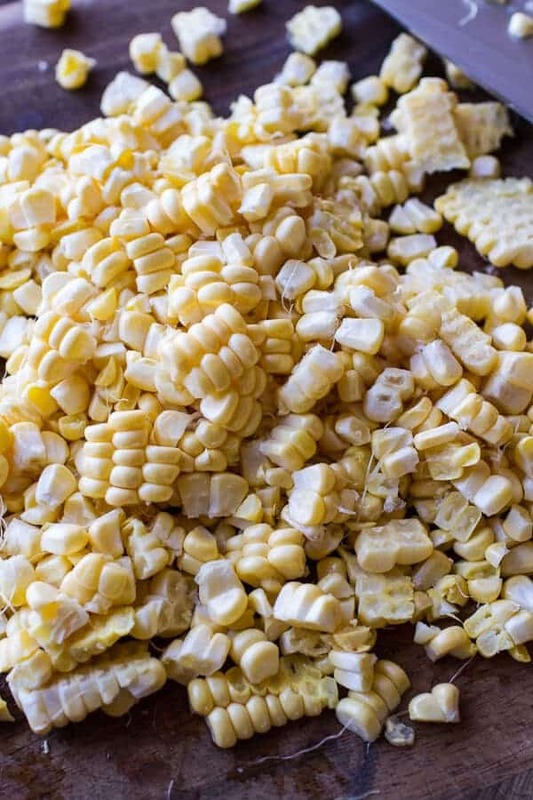 They are crunchy on the outside, soft in the middle, sweet from the corn and umm, the cotija cheese – yeah, that should pretty much have you sold. Really, I do not think I could think of a better game day burger if I tried. Your tailgating party needs these, your Labor Day needs these, your Sunday night, Monday night and jeez, even your Thursday night needs these. Heck, even tonight you needs these. It’s mid week so make something fun. Something down right delicious is always needed, it’ll help get you through till Friday! To prepare the burgers add the ground turkey or chicken to a medium bowl. Add the panko, lime juice, garlic, chipotle chiles, brown sugar, oregano, cumin, smoked paprika and a pinch of both salt and pepper. Mix until just combined and then form the meat into 4 equal size patties. Place on a plate and put in the fridge until ready to cook. To make the corn fritters, add the flour, baking powder, chili powder, smoked paprika, salt, pepper and milk to a bowl. Stir until combined. Fold in the corn, cilantro and cotija cheese. It should be the consistency of a very thick pancake batter, if needed add a tablespoon more of milk. Preheat the oven to 300 degrees F. Preheat your grill to medium high heat. Add oil to a large saucepan and heat over medium high heat. When the oil is hot add a about 1-2 teaspoons of batter to the pot. Fry for 1-2 minutes or until golden brown. Remove with a slotted spoon and drain on a paper towel, then repeat with remaining batter. Keep the fritters warm in the oven until the burgers are ready. Meanwhile turn up your grill or a grill pan to high heat. Grill the burgers for 4 to 5 minutes per side for medium rare or longer for your desired doneness. Add the cheddar cheese during the last minute of cooking. Spread a little mayo over the bottom of the toasted buns. Divide the burgers among the buns. 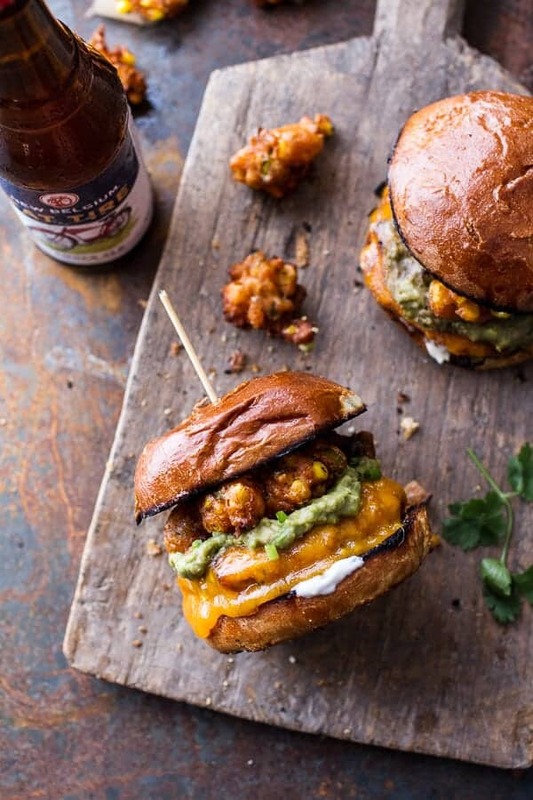 Spread the mashed avocados over the burgers and top with street corn fritters. Add the top bun. DEVOUR. 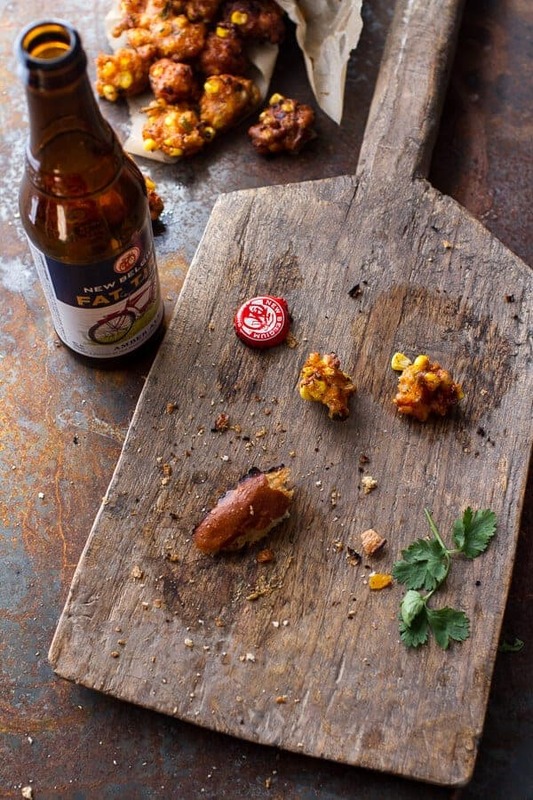 This shot above – it’s just for show, trust me, these corn fritters were all eaten. So don’t leave any behind, they’re just too crazy good to waste!. 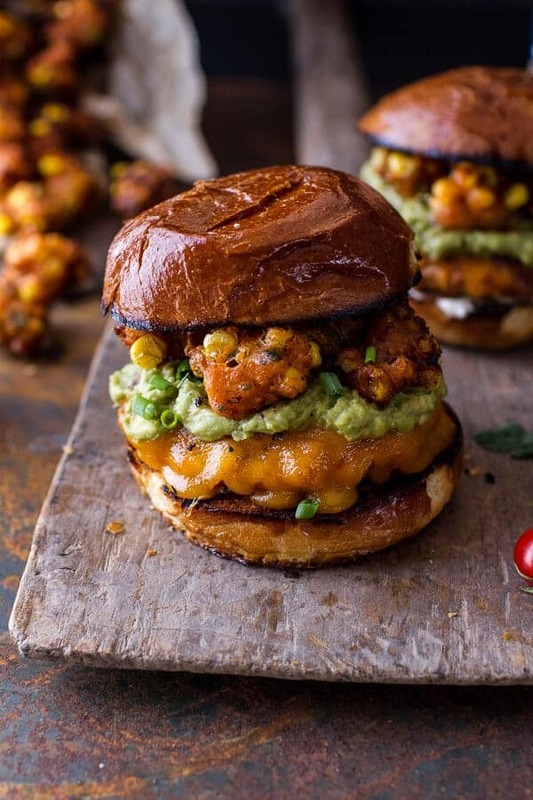 These burgers look insanely good. Tailgating for us (college fb) starts this Friday night so bring on the football food. 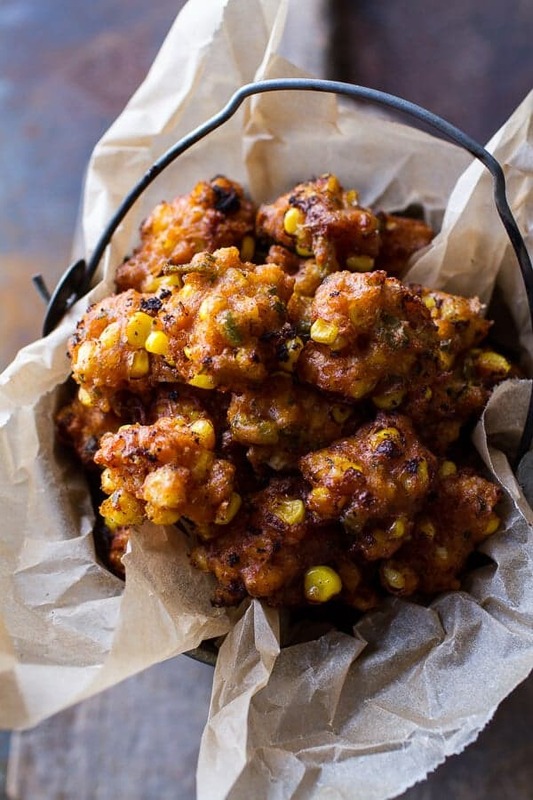 These fritters would be so good on top of anything…chili, corn chowder I can’t wait to try to make them. Oh my gosh! We were already having burgers tonight but I think I need to change to these because they look amazing! I’m having a corn and tomato frenzy too…get it before it’s gone ya know?! Woah these look awesome! brilliant idea to stuff with fritters!! I cannot wait until football season starts as well. I love i just for the food and well, the game too! They burgers look amazing! Definitely making these! I want some of these burger s on game day! i’m drooling – these burgers look fantastic! College football starts TOMORROW here in Seattle with my alma mater’s first game – and OMG so excited. I want to tailgate tomorrow with these!! good god, Tieghan. these look freaking amazing!!! Hooray for football season!!!! Bring on the fritters! 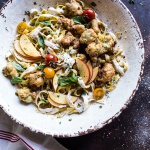 OMG this recipe is screaming my name! I can’t wait to make the corn fritters this weekend! Everyone is going to die to eat them! Thanks for the inspo! Love your blog! Love the corn fritter addition to it! Pure amazingness! And seriously, how are we already at Labor Day?! Why or why am I reading this at lunch time? What an amazing burger. I would order this in a restaurant in a nano second. love your photography, and I’m so excited for football season foods too! These look amazing. 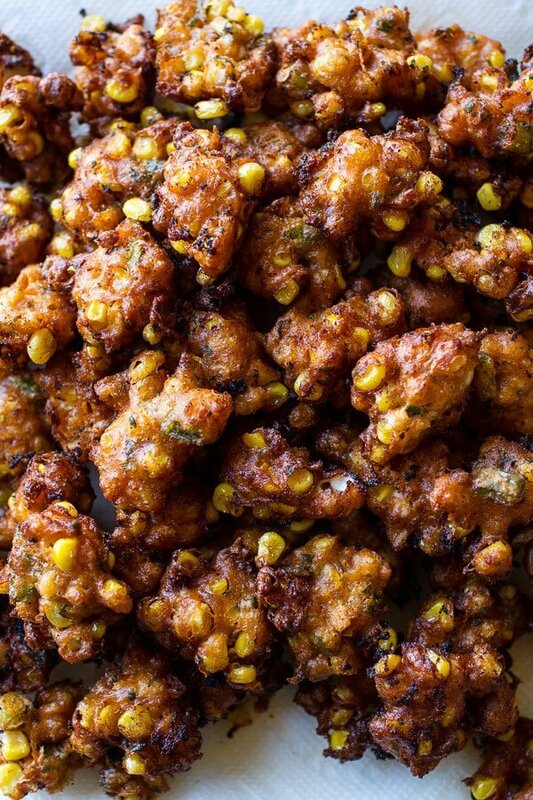 Would the fritters work okay with canned corn? And if I want to serve them alone, any suggestions for a condiment? Thanks Marisa! 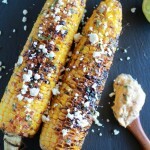 I think canned corn would work great and for a condiment I would do guacamole, mayo, chipotle mayo or avocado crema. Let me know if you have any more questions. I hope nobody else in my house will want to eat these when I make them because HOLY YUM, I need them all in my belly. Those corn fritters! I need this burger!! Seriously? These look ridiculous and they are definitely happening at my house real soon!! 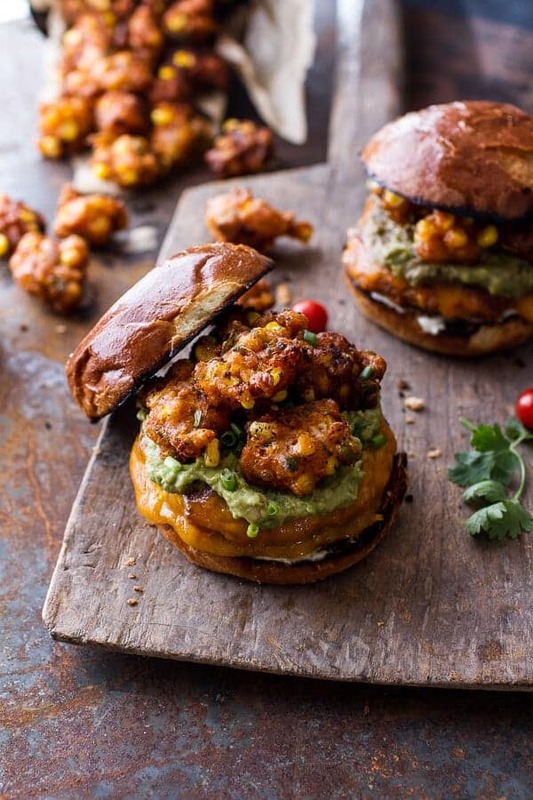 These burgers look incredible but I think the corn fritters are my absolute fave!! These look amazing! Any idea on how to make them vegetarian? 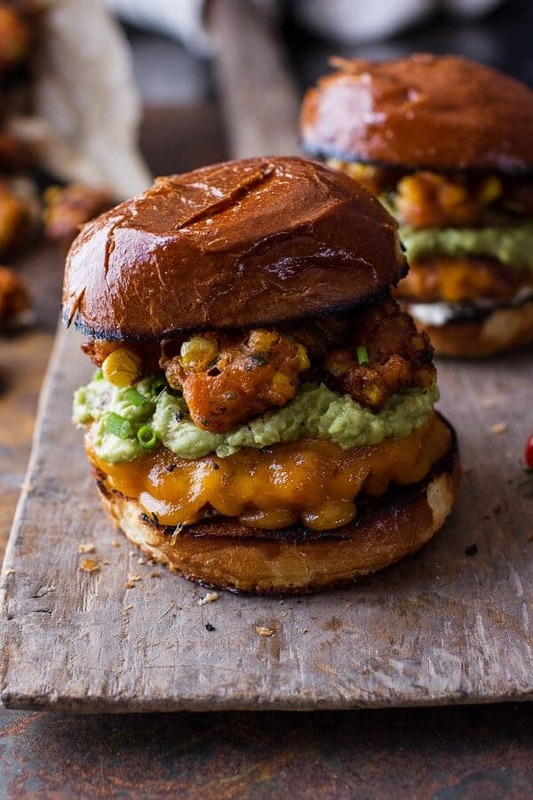 Totally making the corn fritters – I wouldn’t even touch the burger if I had these laying around – love it! Tieghan, these are amazing. Like, I’m seriously considering making this right now… for breakfast. Those corn fritters are stunning! You always have the most creative burger combos, Tieghan! I am currently obsessed with chipotle anything so I will definitely be making these! You’ve outdone yourself this time! I mean seriously?! I’m drooling over here! Thank you so much! 🙂 Hoping you have a great Labor day! Awe, THANK YOU! You are so sweet and I am so crazy excited you are enjoying my site + recipes!! Keep on cooking and if you are on instagram tag me in recipes, I would love to see them! Corn tots?!?!? Those look so amazing. I’m switching up the guac for maybe a blue cheese spread and then eating this burger every day forever. Yea!!! Thank you so much, Renee! I love blue cheese guac! omg. I’m a little slow on the draw here, but whoa. 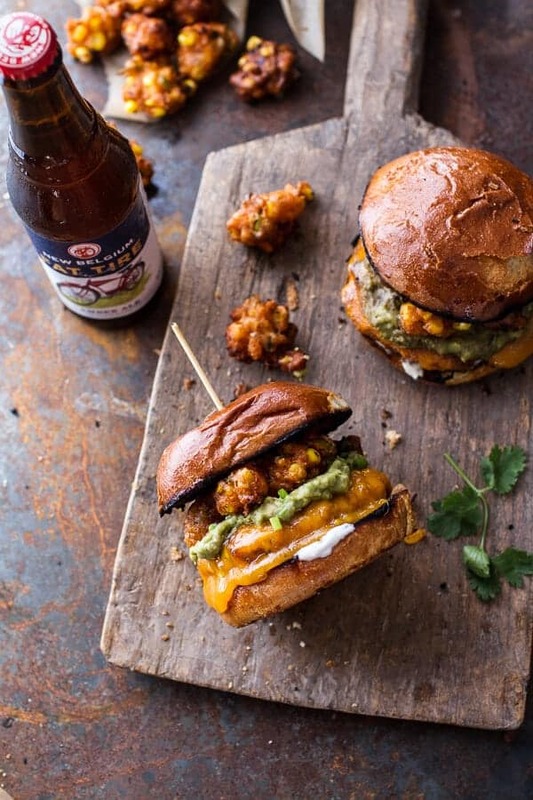 you’ve taken some of my favorite things (epic burgers, fritters, avocados, mexican cheese!) and put them all together in a crazy stack that I totally, totally want to put in my mouth right now! Haha! Thank you so much, Jamie! OMG Tieghan! Every recipe I have made from your blog is awesome!!! The burger and fritters are my favorite- so far. I doubled the recipe and froze them for a busy week night meal. Unfortunately the fritters didn’t make it very long in the freezer because my kids wanted to eat them as snacks and we had a few with eggs for breakfast . Delicious! AWE! Yes! Thank you so much, Nicole! Fritters fro breakfast is genius by the way! This looks amazing!!! Can you clarify the panko measurement for me please? 3/4 of? Thanks! 3/4 cup. Sorry about that. Tried these burgers tonight! One word, “delicious.” We are planning on trying the mexican corn fritters soon! Yummy! These were yummy although a bit messy to eat! Since the cotija cheese came in a 7oz package, I threw the remaining 1-2 ounces into the hamburger mix and it was super tasty! My 16-month-old loved the burger and the corn fritters! WOW! Now that is a serious burger. 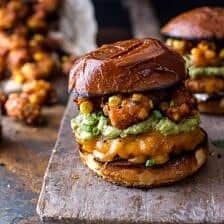 Just came across your recipe at pinterest and now i’m drooling lol i love corn fritters and in the burger it’s just an awesome idea. do you make your brioche burger buns yourself? and could you please give me the recipe?! Sorry, I actually did not make those buns. Hey Tieghan, do you think the burgers could be made vegetarian easily? Like maybe using black beans instead of ground chicken or turkey? I can’t wait to try these! They sound SO good!! That is what I love to hear! So happy you all liked this one and it turned out great! Thank you Mark! And the jalapeno and green onion go where? Not too sure about your medium-rare suggestion for chicken…Also, you have neglected to say where the jalapeño and green onions go that are included in the fritter recipe. Was very tasty with the chicken cooked thoroughly! Making these this weekend for sure!!! I’m assuming you could swap beef and it would be ok?